Barker Bill's Trick Shooting is a light-gun game that was only released in Europe and North America. There's four modes, including Balloon Saloon where balloons rise from behind a panel and you must shoot them before they exit the top of the screen. The dog from Duck Hunt (1985, NES) sometimes pops up and care must be taken to not blast him as you'll lose one of your ten credits! It's basic, but I like that the balloons move at different speeds, as it forces rapid decisions in terms of which one to hit next. In Flying Saucers, saucers are thrown into the air and it's your job to shoot them before they hit the ground. The simple, yet genius part is that you gain more points the closer the saucer is to landing; this adds a fun risk-reward element and basically makes you gamble for a high score. 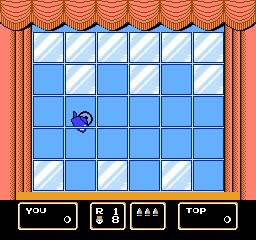 Window Pains tasks you with shooting items as they fall from the top of the screen, but you must be careful not to fire when they're behind a glass pain. The items fall at varying speeds which challenges your timing, and having barriers (that change location in each round) is a fantastic idea to test your accuracy. Lastly, Fun Follies amalgamates all of the above into an endurance mode. It also features exclusive mini-games such as Trixie's Shot, where you need to shoot coins when they're revealed by a dancing woman. This is the only mode where the hit detection is shaky and it makes things unnecessarily difficult. Bill's Thrills appears if you reach Round 9 and your job is to shoot food before it hits the assistant's head. It's nerve-racking waiting for the food to fall and considering you only have one shot it's fun in a Western quick-draw kind of way! Even failure is hilarious when you see the assistant's angry reactions! Barker Bill's Trick Shooting doesn't have a ton of content, but it's still an enjoyable carnival game with great controls and well thought-out modes. Its main flaw is that it plays things safe and does nothing to advance the genre when compared to Nintendo's first generation Zapper titles such as Hogan's Alley (1985) and Wild Gunman (1985). Random trivia: The game is based on a 1952 cartoon series called Barker Bill's Cartoon Show.